At SECHD Physical Therapy we work to improve all aspects of your active lifestyle. Physical therapy promotes your optimal health and function through the application of scientific principles to evaluate, correct and prevent movement dysfunctions. We improve the way you move. Our rehab team possesses more than 100 years of experience in rehabilitation while we focus on providing best up to date treatments, techniques and modalities. As a department we provide services for many areas in the community including hospital and skilled swing care, outpatient services, facility based long term/memory care, and home health care covering Baca County. We have many staff certifications and qualifications including board certified staff that can be found listed below. 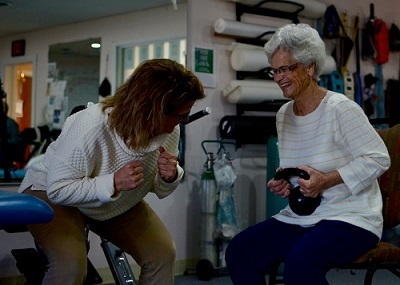 Our therapists provide many skilled treatment approaches that are effective in managing pain, strengthening weak muscles, improving balance and reducing falls risk, providing work conditioning, increasing athletic performance, improving quality of life and getting you back to doing what you want to be doing. We work very closely with medical, nursing and other healthcare related staff to provide a comprehensive state of the art service to each of our patients and residents. We treat across the lifespan from pediatric early intervention to geriatrics in our outpatient clinic, home health department, hospital, long term care and Alzheimer's unit. We also offer outpatient services in the adjacent Walsh Health Care Center.